If you are anything like me and I can only assume you might be slightly since you are reading this? I see a recipe that sounds delicious so I either end up printing it or ripping it out of whatever I am looking at. However I do tend to steer clear of ones that look difficult; you know the ones that have the never ending list of ingredients and pages of steps. I just don’t have the time or the energy to even attempt them. I am however not afraid to pick up an ingredient or two that is generally not on my shopping list. I purchased a jicama to try to make deviled eggs that I had at Coastal Flats in VA. I bought a Chinese cabbage to make dumplings. Just this week I bought some buttermilk to make a Texas Sheet cake (recipe 3/31/2014) The good news is I was able to make what I wanted; the bad news is what to do with the leftover ingredient? I hate to waste anything so I will either come up with or look for something I can make with it before it goes bad. I‘m pretty sure I passed the waste not thinking onto my husband; or maybe he came like that? He saw one lonely ripe banana on the counter this morning and made banana pancakes for us for breakfast. I am currently soaking some chicken thighs in some of the buttermilk, and I have a little left, OK I made sure I had enough left over to make some doughnut holes. I found a 15 minute doughnut-hole recipe online quite a while ago. They are easy and pretty damn good. I cut up the rest of the jicama added some diced carrots and broccoli for a vegetable medley for dinner one night and the Chinese cabbage stays really well in the fridge for at least a couple of weeks in the veggie drawer. Cut off what you need at a time, it adds great crunch to a salad. My mother-in-law mentioned the other day that she was looking for some crock-pot recipes, I noticed a slow cooker magazine at my local grocery store and I figured I would check it out and then give it to her. While looking at it I started marking pages; I can’t tell you how many times I see a recipe that looks awesome and make a note to try it later and never find it again. After marking like 7 pages I quickly came to the conclusion; I am going to have to buy her her own copy. Like most I don’t always have a ton of time in the morning so I planned on prepping both my dinner for the night and the crock-pot for the next day. If I have several dishes in mind I will always cut enough onions, peppers, garlic and potatoes and carrots or whatever I am going to use in multiple dishes all at the same time and just set aside per dish. You already have the cutting board and knife out just keep going; you’ll be happy you did. Though sometimes it doesn’t always work out quite like you planned; both dishes I was making asked for some dry white wine. I opened a bottle made the first dish, poured myself a glass, my husband walking by decided he wanted a glass, by the time I got around to making the meal for the slow cooker, yup I was out of wine and had to open another bottle. It was worth it, the chicken from the crock-pot was amazing. We didn’t save the leftover carrots and mushrooms but we did have a couple of chicken breast (they were large ones) they were so flavorful and moist, so much so my husband sent me a text on his lunch telling me how amazing his sandwich was. He just asked me what I was blogging about and told me to tell you that the chicken has a great flavor and he really likes it. He is so helpful wink wink. Pat chicken dry, season with salt and pepper. Heat a tablespoon of oil in a skillet over medium high heat. Add chicken skin side down, do not crowd the pan. Repeat with remaining chicken. Set aside and let cool. Remove and discard the skin. Add remaining oil, mushrooms, onions, thyme and some salt to the pan. Cover and cook till softened, about 10 minutes. Uncover continue to cook until the mushrooms are dry and browned about 10 minutes. Stir in garlic and cook about 30 seconds, stir in flour and cook for about a minute. Slowly whisk in the wine, scraping up any browned bits and smoothing out any lumps. Transfer to slow cooker. Transfer chicken and vegetables to a serving platter and tent loosely with foil. 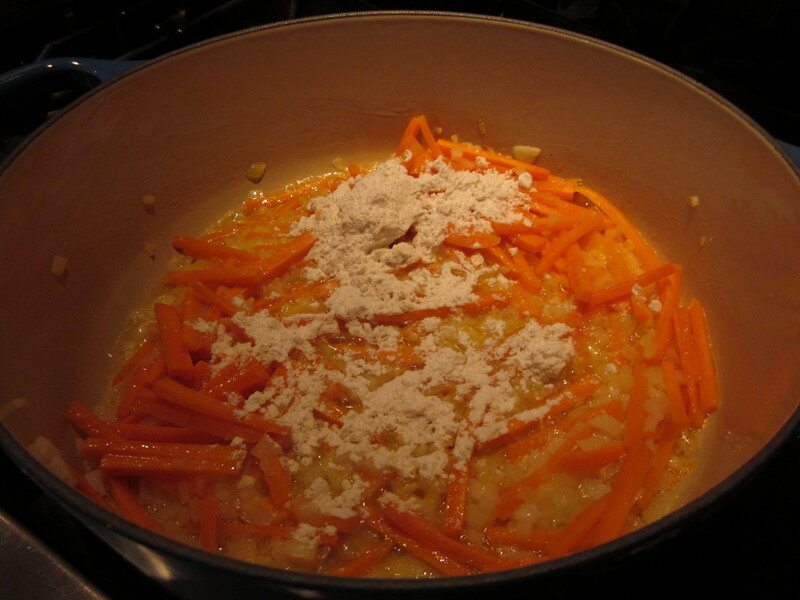 Let braising liquid settle for about 5 minutes; remove any excess fat from the surface. Discard bay leaves. Stir in cream and tarragon and season with salt and pepper to taste. Reserving 1-2 cups of sauce to serve with chicken pour the remaining over the chicken and veggies. I have been making this particular chocolate cake for as long as I can remember; at least since I was in middle school. I am not entirely sure where it came from but I believe it has been around for many many years. If you are looking for a great recipe to teach a child try this one. It mixes easy in one bowl and is pretty forgiving. The frosting is pretty simple as well. The benefit is no box is necessary. If your house is anything like mine, any given night an impromptu dinner party can happen. I am pretty sure the majority of people out there like a little something sweet to have after dinner. I believe it is always a good idea to have a few recipes in your back pocket for such an event. It also helps if the recipe has everyday ingredients you probably already have on hand. It doesn’t take long to put together or bake. I think the longest part of the process is waiting for it to cool. I know be impatient; I have even served it slightly warm. You know when you go to someones house for dinner and you are asked to bring the dessert. Even though you are full everyone still wants to at least sample it. The host insists you bring the leftovers home. Well I have not been asked to bring this one home. This delicious cake meets all of the requirements I listed above; plus it travels well. Add all ingredients in a bowl and mix well. Spray a 9×9 pan or similar. This makes one small cake I tried doubling it but I didn’t care for the way it came out. It is so easy to throw together if you want to make a layer cake just add ingredients to the same bowl. In a mixing bowl add all the ingredients turn on the mixer on medium until all combined about 3 minutes. You may need to scrape down the sides of the bowl. Who doesn’t need to use up some of the leftover ham from Easter? I swear the weather this weekend also helped dictate what I ended up making. It has been rainy, raw and just plain chilly, kind of like a fall day. 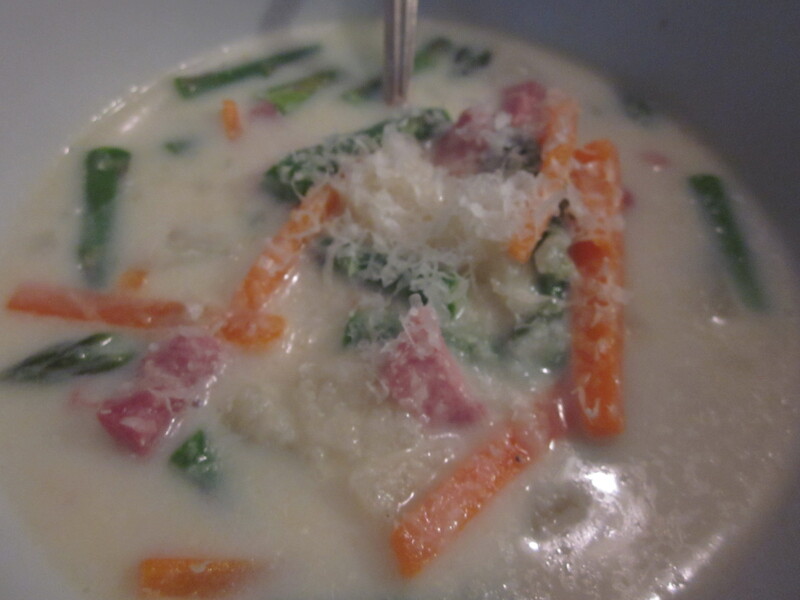 It also helps that one of my favorite soups is creamy ham and asparagus. It is so satisfying, it is simple to make and warms you from the inside out. I also make this when I have leftover asparagus; I guess pretty much any excuse works for me. I do know many people who are not soup people, I don’t get that at all, and I kind of feel bad for them? Maybe they have never had a good tasting soup? Maybe when they were little soup was their meatloaf & peas (two of my childhood nightmares) I do like peas now but I still refuse to eat meatloaf. I love meatballs but no loaf. It’s a mental thing I know. That must be it! On the other spectrum I have had a few people come up to me at work while I was re-heating my yummy soup for lunch and really want to make homemade soups but have had terrible luck so have given up; which is really sad. I have had a soup class and hope to again – I will help and or convert as many as will let me. Passing it on – My son was looking around the kitchen to see if we had any canned soups. I convinced him that he could make a delicious tomato soup, fairly easily and would taste a million times better than anything he could get from a can. I got out all the ingredients and while sitting at the island working; I guided him through the process. He wanted to make the soup all on his own, that’s my boy! If you have some things to use up in the fridge and a little time I believe soup is a great way to feed yourself and your family. 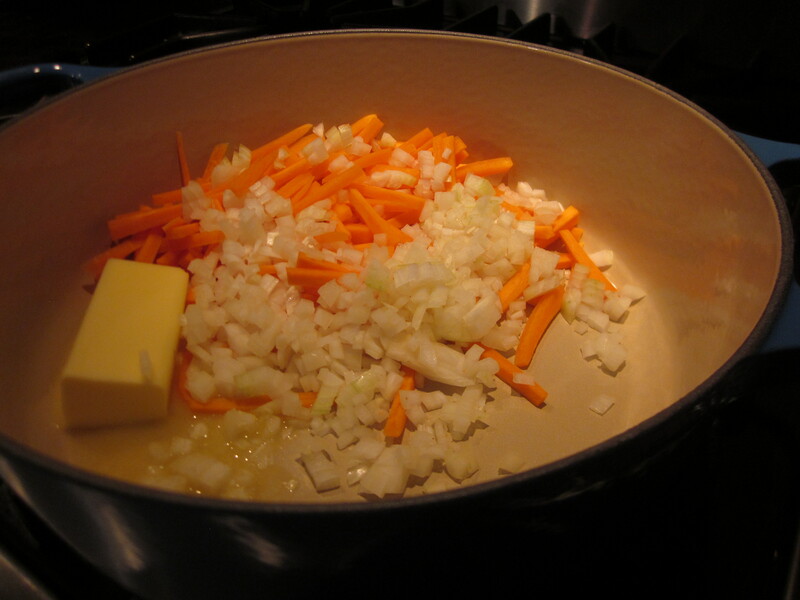 In a heavy saucepan, sauté carrots in butter for 3-5 minutes; add onions and garlic and sauté a couple of minutes longer or until tender. Stir in flour; gradually add milk. Bring to a boil; boil and stir for 2 minutes, add broth, ham and reserved asparagus. Reduce heat and simmer. Add salt and pepper to taste. Garnish with freshly grated parmesan cheese. Slight variation – You can also add a couple of potatoes if you wanted a little heartier soup, you could also add your favorite herb to change it up a bit. If you add raw potato, cut them up small and simmer long enough to cook them probably 20-30 minutes. Increase the chicken stock for a lighter soup or a little more milk. 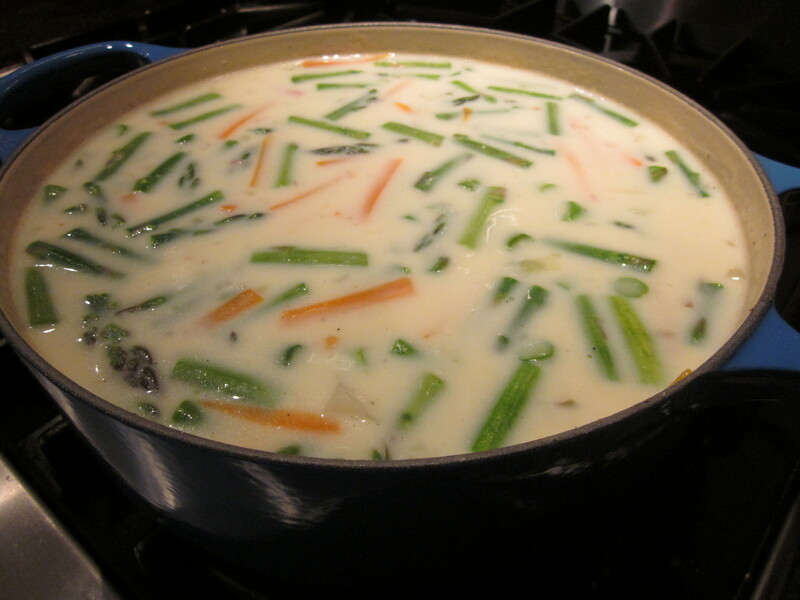 if you wanted a really creamy soup, substitue 1 cup of half and half for 1 of the cups of milk – BUT do not boil the soup once you add the half and half. You can let it simmer to heat through but do not let it boil.